Back and hip pain during pregnancy is no joke and there’s a limit on how much Extra Strength Tylenol you can pop in a day. Warm baths and chiropractic care can help with this discomfort along with yoga. I have to admit, a few years ago I was nervous to try yoga. I knew I’d be the biggest person in the room and I wasn’t sure what my body was capable of doing. I’m so glad a friend dragged me to her favorite prenatal yoga class because it truly was a positive experience. Not only did it help with my hip pain during pregnancy, but yoga also teaches you how to control your breath and tune into your body. Two really beneficial techniques for labor! I’m delighted Amber Karnes, a wonderful yoga teacher, has joined the PSMM blog. 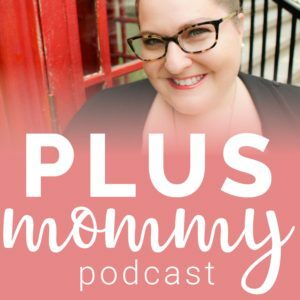 Her work inspires me and she put together a 20 minute video for us that isn’t just for pregnant women. Enjoy! Hey there! I’m Amber. I’m a plus sized woman and I’m also a yoga teacher and founder of Body Positive Yoga. I specialize in yoga for bigger bodies, creaky joints, and complete beginners. I am not pregnant myself, but I do have a belly, so – solidarity, sisters. Nice to meet you all! To everyone who is reading this and expecting a baby, a hearty congratulations from me to you! While a new baby is a joyous occasion, from what my sister and my sister-in-law tell me, pregnancy can be pretty miserable as far as low back pain and hip pain go! I was really excited when Jen asked me to put together a yoga sequence to help relieve low back pain for plus size moms. I hope you enjoy this 20 minute yoga video for relieving back and hip pain. Disclaimer: this video is for educational purposes only, and is not medical advice – it shouldn’t be used as such. Please don’t do any pose that is uncomfortable. Although I believe all these poses to be safe for pregnant women in small doses, to be safe, please check with your doctor before performing any of these exercises. Amber Karnes is an aspiring yogi, RYT-200 yoga asana teacher, and a lifelong student of her body. 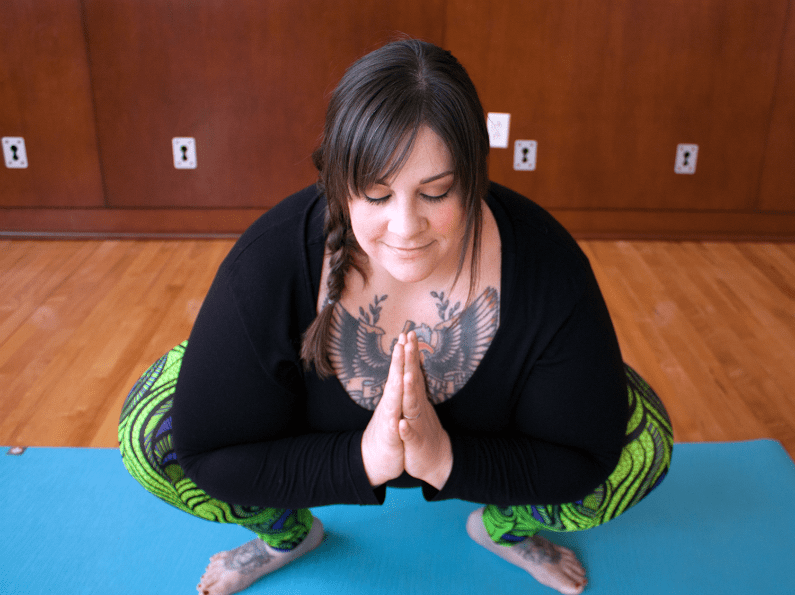 For Amber, yoga has been an integral part of a decade-long journey toward self-acceptance and body positivity – a journey of making peace with her body and helping others to do the same. Amber’s teaching emphasizes safe alignment and mindful transitions. She encourages each student to honor the body they bring to the mat today, while being empowered to learn about the body’s intelligence and power. Amber serves on the Yoga and Body Image Coalition and blogs at bodypositiveyoga.com. Yes! I love this so much. I struggle with getting my plus size friends to come to yoga because I fit the standard yogi body type. It doesn’t help that I live in an extreme sports mecca where people are routinely hyper healthy and all in a similar body type. I’m so glad you enjoyed it! Yes, yoga is for EVERYbody!